BioDiscovery Group always believes in creativity and innovation is the key to our success. 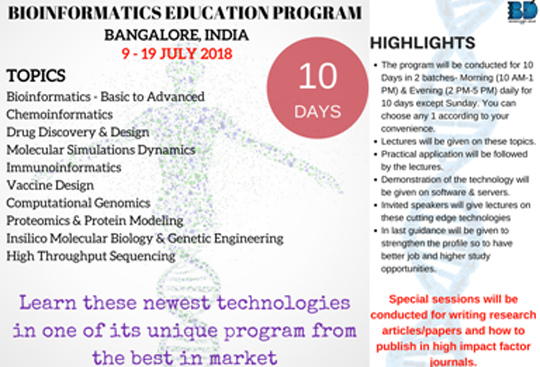 We bring to you BIOINFORMATICS EDUCATION PROGRAM which is a 10 day extensive learning program involving lectures, practical application and demonstration of the technology. As this program is targeted to students hence the fee is minimal to learn the latest technology. Faculties & Guides are requested to send their students/research scholars for a great learning experience. P.S- Accommodation can be arranged at nearby PGs on request. · The program will be conducted for 10 Days in 2 batches- Morning (10 AM-1 PM) & Evening (2 PM-5 PM) daily for 10 days except Sunday. You can choose any 1 according to your convenience. · Lectures will be given on these topics. · Practical application will be followed by the lectures. · Demonstration of the technology will be given on software & servers. · In last guidance will be given to strengthen the profile so to have better job and higher study opportunities.